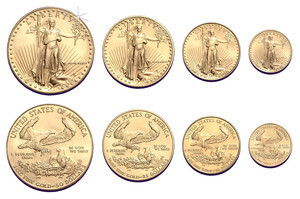 The American Gold Eagle is an official gold bullion coin of the United States. The gold used comes from American soil and the coins have an additional alloy of silver and copper to make the coins more resistant (22 karat, English standard for gold coins, and before 1834, for American gold coins). They are authorized by the United States Congress and certified by the United States Mint for their weight and content. The obverse design consists of the full length figure of the Statue of Liberty with flowing hair holding a torch in her right hand, an olive branch in her left and the Capitol building in the background. The reverse features an eagle carrying an olive branch flying above a nest with a mother eagle and her hatchlings.